Pesto can be made from really anything — you don’t even need a green thing, strictly speaking. Basil pesto is the standard of course, but I’ve also seen it done with also mint, parsley, cilantro and other herbs. No reason not to make it with stinging nettles. The Italians actually do make a nettle pesto in springtime; they call it pesto d’urtica. Nettle pesto tastes very “green,” and isn’t as aromatic as a basil pesto, but it tastes great and can be done in very early spring, as can my recipe for walnut and parsley pesto; walnut-parsley pesto is a cool weather standard in Italy. 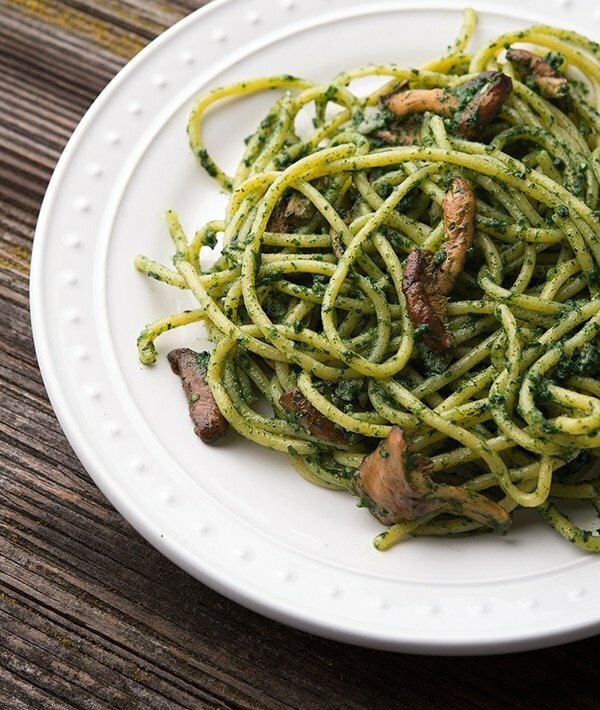 I also have a fun recipe for ramp pesto and one for arugula pesto, too. You will need two or three big tong-fulls of fresh stinging nettles for this recipe. I say tong-fulls because you do not want to pick up fresh nettles, as they will sting you. Thus the name. Get a huge pot of water boiling and add a handful of salt. Grab the nettles with tongs and put them into the boiling water. Stir around and boil for about 90 seconds. Get a cloth towel, like a tea towel, and put the nettles in it. Wrap one end of the towel one way, then the other end of the towel the other and squeeze out as much moisture as you can. Chop them fine before making the pesto. How do you use your pesto? Well, on pasta is a gimme (note the photos), but it is also excellent on toast, stirred into rice at the last minute, spread over white meat poultry (chicken, pheasant, quail, grouse, turkey) or rabbit — or over fish. 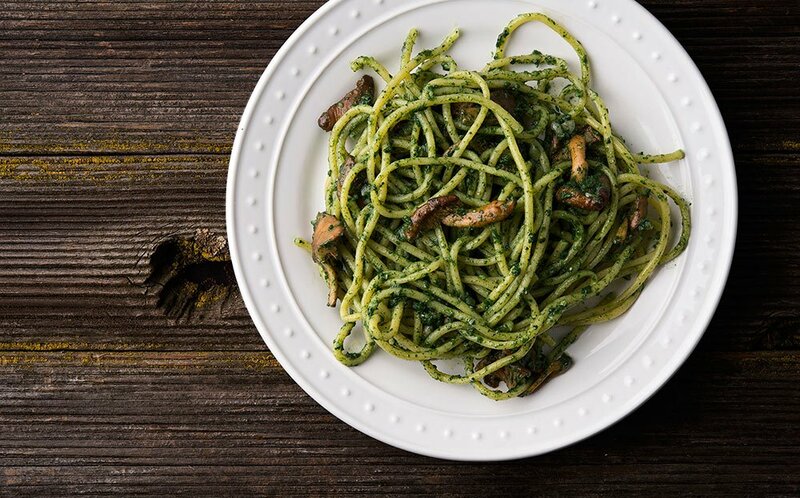 I love nettle pesto on spring-run chinook salmon, for example, and it’s great on striped bass or walleye, too. 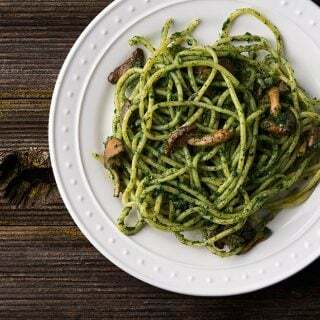 This is a basic pesto recipe with nettles subbing in for basil. You can use basil in its place, or parsley or some other nice green thing. You can also use different nuts; walnuts make a good pesto with nettles. I prefer Parmigiano-Reggiano cheese, but any good hard cheese will do. Since you've blanched the nettles, they will not oxidize and turn brown easily. So you can store this pesto in the fridge for up to a week, maybe more. Pesto is best made with a mortar and pestle, thus the name, which means "pound." You can make this in a food processor, but it will not be the same. First add the toasted pine nuts and crush lightly -- as they are roundish, they will jump out of your mortar if you get too vigorous. If you are using a processor, pulse a couple times. Add the garlic to the mortar, then pound it all enough so that the pieces don't fly around. Add the salt, cheese and the nettles and commence pounding. Mash everything together, stirring with the pestle and mashing well so it is all fairly uniform. With a food processor, run the machine so everything combines, but isn't a smooth paste. You want it with some texture. Start adding olive oil. How much? Depends on how you are using your pesto. If you are making a spread, maybe 2 tablespoons. If a pasta sauce, double that or more. Either way, you add 1 tablespoon at a time, pounding and stirring to incorporate it. If you are using the processor, drizzle it in a little at a time. Serve as a spread on bread, as an additive to a minestrone (like this one), as a pasta sauce or as a dollop on fish or poultry. Find many more recipes for nettles and other spring greens here on Hunter Angler Gardener Cook! I just made this for the first time. I usually make pesto with cilantro and hemp seeds and serve over parsnip and carrot strips. 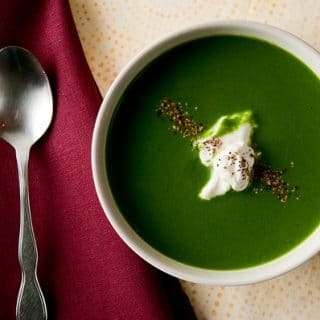 I made this today with nettle, hemp seed hearts instead of pine nuts (I always have it on hand is why) and it was more “green” tasting and minty ish scented than expected. A little bitter., too. I made my husband get stung today to test it. Btw the young seedlings (only six leaves on the entire plant) did not sting. The larger adult plants really stung! The young ones were very delicate, is this normal? I’m not sure I like nettle 🙁 I had a few fern fiddleheads and mallow as well today. All very little tastes since this was my first time, really. Thank you for your site!